After an extra hour’s sleep we leave the quay through a very small turnstile. I think some of our fellow cruise-goers could have difficulties with this but we squeeze through with only minor damage as the turnstile revolves onto the backs of our ankles. Our ‘Purple 7’ tour requires us to use the tightest seat belts in the world; Stockholm is clearly only for the ultra-skinny. Juggling said seatbelts with the headsets that have been provided, cameras and sea-pass lanyards means that we are in danger of being garrotted. Just as we negotiate these hazards the coach stops for a photo opportunity and we have to extricate ourselves once again. Some of the facts that we glean are that Stockholm was established in the C13th under Danish rule. Fifty seven bridges join the fourteen islands of central Stockholm. 8% of Sweden’s area is lakes and a further 30% is forested, making forestry a major industry. A number of the building are painted a deep red that is by-product of copper mining and acts as a wood preservative. The city is full of attractive tree-lined streets and parks; apparently house plants are also important in apartments. We see the Royal Mausoleum and the City Hall, which was built between 1911 and 1923. At 196 metres high, it required eight million 7kg bricks to build and is where the banquet is held following the nobel prize awards. This takes place in the ‘blue room’, which was initially painted red; due to a reluctance to change, it is actually still red despite retaining the ‘blue’ name. We also see the Concert House in King Street, where the nobel prizes are actually awarded. Cultural activities are key in Stockholm, which contains 85 museums. We pass the Nordic Museum, the Abba Museum, where one can sing and dance along with Abba, supposing one would want to and a museum that sounds a little like St Fagans and would have been interesting. Popular Swedish food includes meat balls, sausage, salmon and cod. Very little fried food is eaten, although there are MacDonalds and the Swedish equivalent ‘Max‘, which uses local produce and serves smaller portions. Swedish dining traditionally finishes with coffee and seven sweet things – sound eminently sensible to me. Sweden is a family orientated country; one year’s ‘maternity’ leave on 85% pay is shared between parents and at least two months of this must be taken by the father. Our shore excursions were chosen in haste, rather than being the result of informed consideration and I chose today’s because it mentioned ‘maritime museum’ and I was considering my travel companion. It turns out that a trip to the Vasa Museum was ideal for us as the Vasa is a C17th ship and the museum was all about ‘our’ period. The Vasa was built from 200 oaks on the orders of Gustav II in 1624, during the war between Protestant Sweden and Catholic Poland. The boat was a symbol of status and contained 700 painted wooden sculptures, including a lion figure-head to represent Gustav. When it was launched in 1628, the Vasa sailed a mile and then sank. This was because a second, lower, row of cannon ports were added and these ended up below the water line. There were unsuccessful attempts to apportion blame for this epic example of bad planning. The ship was found by divers in 1956 and was then raised, rebuilt and preserved over many years, very similar to the Mary Rose. Many artefacts had been looted but a number remained. Sadly, this is another tourist sausage-machine and a good proportion of the 1.3 million annual visitors to the museum seem to have chosen today. We had an hour to look round but could easily have spent four. Unfortunately, we missed the part which told the stories of individuals based on the skeletal remains. We were advised not to leave visiting the shop to the last minute because of queues. Never mind the shop, the length of the toilet queue was only exceeded by the queue to get in, for those not in a pre-booked group. I had taken my laptop in the hope of free wi-fi and wandered round the museum downloading over 200 emails that had arrived since I left home. Microsoft, in their wisdom, recognised that I was logging in from an unusual location and refused to download from my primary email account – goodness knows how many more emails there were in there. I did not have the chance to rectify this so did not know what I was missing. We see the Royal Palace with its 608 rooms, which is bizarrely covered in net. Outside they are changing the guard but we have to view this from inside the coach, perhaps just as well, given the seatbelt issues. Then there is a slight panic as I realise that my sea pass is not in its holder round my neck. Hmm, not only will I not be able to get back on board but someone could be running up a huge bill at my expense. Fortunately I discover it down the side of the seat. Perhaps it fell victim to the seatbelt struggles. Back on board, we laze on deck 12, slightly more sheltered than the upper decks and affording protection from sudden thunder storms. Unsurprisingly, given our latitude, the rapidly changing weather is similar to that in Scotland. We watch running passengers and speeding taxis screeching to a halt, as the time for our departure nears. Once afloat, it transpires that one of our party has been marooned in Stockholm, causing concern. 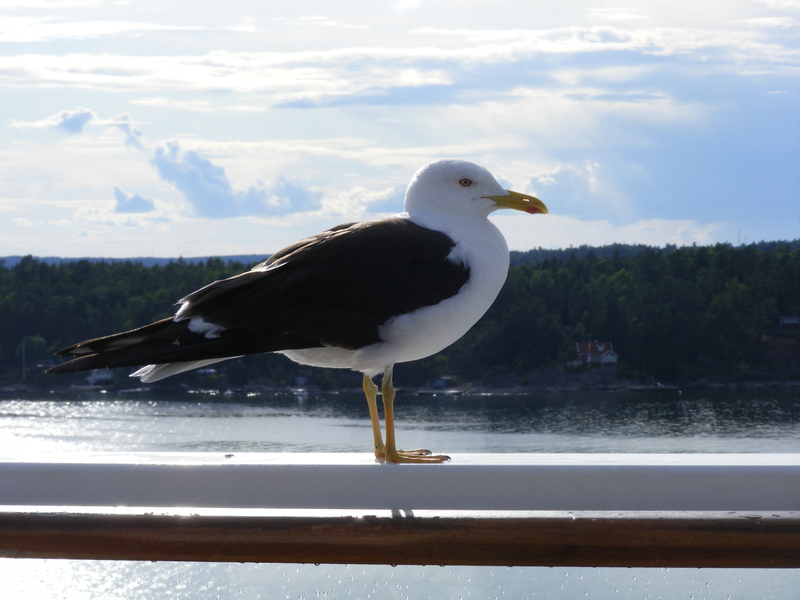 Sailing out past the many islands of the Stockholm archipelago is very beautiful and black-headed gulls wheel past, accompanying our ship for a considerable way. This provides a distraction for Jane’s audience when she is talking about restoring photographs but she copes well and the session is very interesting.